Please bring back the default "Auto Image Size" option. This allowed the user to keep a default image size setting for every time you opened an image. Currently on version .81, XnViewMP, once you use "Fit size to window" it defaults to that setting and it's very difficult to change it to "No Fit" (default image size). I say difficult, because every time I want to go back to original resolution, I must press "*" for 100% resolution. 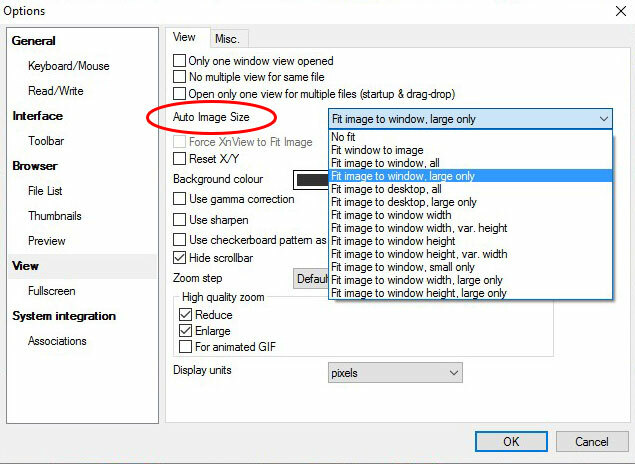 Currently, if I open an image and leave the option at "Fit size to window" or change the image size because I wanted to upscale a small image, my next image that I open that is smaller than my screen resolution with will automatically open at "Fit to full screen", instead of at it's original resolution. If you use "Fit size to window", you can change the setting after and it will be kept next time. not for you? please tell me how to reproduce? xnview wrote: If you use "Fit size to window", you can change the setting after and it will be kept next time. not for you? I think you may have misunderstood my request (probably because I made such a complicated explanation, sorry). What I want is the default setting for whenever I open an image to be set on "Fit image to window, large only". Currently, if I use "Fit image to window, large only", then increase/decrease the size of the image or use "Fit image to window", the next time I open an image, it will automatically use "Fit image to window". 1. open image, use "Fit image to window, large only"
3. open image = Will be set to "Fit image to window"
3. open image = will be at default setting "Fit image to window, large only"
Yes, please, make it as in original XnView! It was very convenient. - When I click on image smaller than my screen, XnView window opens in sizes of that image (without any empty spaces around image inside window). - And if image is too big, then XnView window opens maximized and image scales to window's size. See Issue 909 for details. xnview wrote: See Issue 909 for details. What can I find there? Its nothing there. Not a comment, not a solution for the problem. Please, I am searching for a proper Image Program forever. None seems to provide the most SIMPLE Options I need for image preview. It says “Fixed in Version 0.82” which is currently undergoing beta testing and will soon be released. See also: View first unread post How to make default "Auto Image Size > Fit image to window"? This has been on my wishlist for a long time, it was actually the main reason why I still had XnView installed in parallel to XnViewMP. Thanks to the Xn team for implementing it! Version 2.38 and still not working. This is an issue for 11 years with this program already and is still not fixed? AngryUser wrote: Version 2.38 and still not working. Auto Image size setting (in my case "Fit Window size - all pictures") is not saved but only applies when I use it with hotkey. I really like XNview because it has all the features I need, but with that particular problem it is not usefull for me sadly. And it seems to be a bug too, since the whole option seems to be there to be saved, no matter how many pics I open or if I exit the program and start it again.